After Tuesday evening’s last-gasp win over Oxford City, the Cards are now sitting pretty at the top of the National League South table with a three-point lead, a gap they’ll be looking to at least maintain this weekend when they travel to play-off bound Welling United. Woking were forced to come from behind last time out as, ironically, both Oxford United loanees Armani Little and Harvey Bradbury scored against their city rivals to cancel out Kabongo Tshimanga’s penalty and secure Alan Dowson’s side a vital three points. Torquay still have a game in hand and a superior goal difference but the Cards will know that if they can maintain their lead at the top then the pressure will be on the Gulls to respond in kind. However, they’ll no doubt get a stern test this weekend, with in-form Welling playing hosts and looking to maintain their own promotion push. 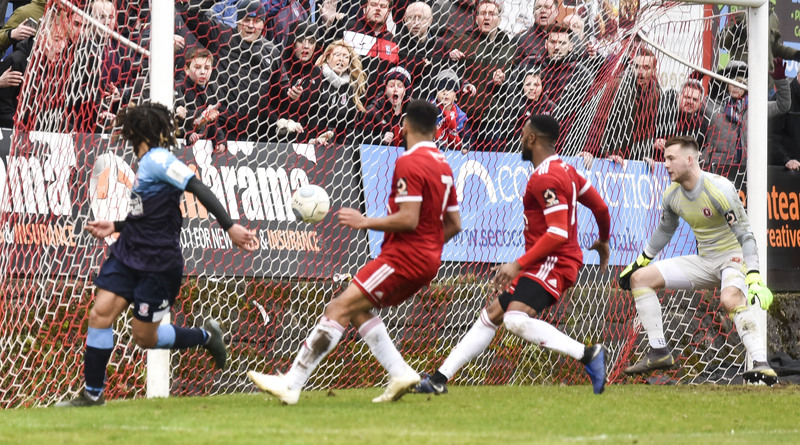 Welling have had a good season and, whilst they look almost certain to fall short of the title challenge many predicted for them, they are well set to improve on last season’s tenth place finish and secure a place in the end of season play-offs. They currently sit in fourth place with 60 points from their 34 games, a point behind third place Bath City, a spot which would get them a bye through the first play-off eliminator round. They also have a seven-point cushion on eight place Wealdstone. After a mid-season dip their form has picked up recently – they’ve lost only two out of nine league matches since defeat at Kingfield back in January, whilst they’ve also picked up 13 points out of a possible 15 from their last five games, which has included an impressive 2-0 home win over Torquay. This is a crucial game in the title race so please come along if you can and support the team! Dowse is likely to make at least a couple of changes from the team which started against Oxford. In defence, Moussa Diarra is a doubt after being forced off in mid-week, with Jack Cook the obvious replacement to play alongside Ben Gerring, Nathan Collier and Josh Casey at the back. In midfield, Olu Durojaiye should start against his former club, whilst it’ll be interesting to see if there is room for both Armani Little and Christian Jolley as Dowse potentially looks to strengthen his midfield. Up front, Jake Hyde should be available again after being protected on Tuesday night’s artificial surface, while goalscoring hero Harvey Bradbury will no doubt be pushing for a start. The Wings, managed by Steve King, won 3-1 at Wealdstone in their last outing. Their team that day included Dan Wilks in goal; a back five of Caden Genovesi, on loan from Queens Park Rangers, former Woking loanee Craig Braham-Barrett, Anthony Acheampong, ex-Notts County and Barrow man Thierry Audel and Josh Hill, a promotion winner from this division with both Boreham Wood and Braintree Town. In midfield was Montel Agyemang, signed late last year from Wealdstone, along with Julien Anau; while the front three included ex-Hampton winger Brendan Kiernan, who has 12 goals this season, another former Card in the shape of Gavin McCallum, and the dangerous Bradley Goldberg. The ground can be found on Park View Road; the postcode is DA16 1SY – a drive of around one hour from the Laithwaite Community Stadium. The nearest station is Welling which is around a 15-20-minute walk from the ground. Matchday ticket prices are £12 for adults, £8 for concessions, £5 for juniors and free for under-12s. The Cards return to the Laithwaite Community Stadium next Saturday when we host Slough Town. That’s followed by our crucial double header away to Bath City and at home to Torquay.